Solitude really lives up to its name. When Alta and the Bird have crowded parking lots and long lift lines the Tude remains a quite skiers paradise. This shot is in-bounds right of the Summit chairlift on a run called Back Door. It was late in the afternoon and as you can see theirs not a track in sight. The reason we are able to use radar to search for snow is because of an accident during World War II. During this time, military radar operators were using radar to search for aircraft, but they found that the radar screen also came alive when snow and rain was present. When the war ended, research was conducted to figure out if it would be possible to use radar for weather prediction, and in 1953 a radar successfully showed a “hook echo” which is the common look for a thunderstorm that could produce a tornado. After this success, scientists spent decades perfecting the technology and by the late 1990s nearly 150 radars were installed across the United States. Understanding how radar works is important as you’ll likely use it to search for snow during your quest for powder. But before we get into the details, take a moment to remember the difference between satellite and radar. A satellite orbits thousands of miles up in the sky and looks down on the earth. This vantage point allows the satellite to send back images of clouds from above, and these images do play a role in weather prediction. However, snow falls below the clouds, so if a satellite is looking at the tops of the clouds, it can’t be used to actually detect snow. Weather radar sits on the ground and scans the lower atmosphere looking for precipitation. 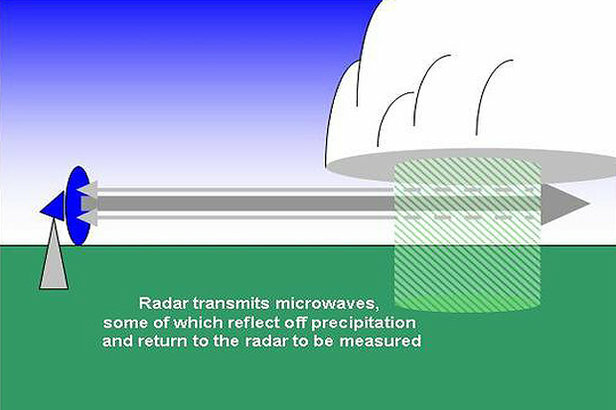 Radar, on the other hand, is a beam that is pointed from the ground up toward the clouds, so it can detect snow that falls from the clouds toward the ground. The radar itself looks like a big satellite dish that is often covered by a white sphere that can resemble a golf ball (albeit a really, really big golf ball). This dish spins around in a circle and sends out a pulse of energy as it spins. If this energy hits something, it bounces back toward the radar dish and computers analyze how much energy was returned and how long it took. This enables the radar to tell us if the precipitation that’s falling is light, medium or heavy, and also where this precipitation is located. This sounds simple enough, but there are some tricks. First, the radar isn’t pointed flat along the ground because it might hit trees or buildings. This would give a false indication that there’s snow or rain falling. Instead, the radar beam is pointed upwards just a bit, or 0.5 degrees to be exact. This alleviates the problem of the radar hitting things near the ground, but it also means that the beam gets higher and higher into the sky as it moves away from the radar, so it can miss some snow that’s falling close to the ground. Another trick to radar is realizing its limitations based on geography. For folks exploring ski areas on the east coast or midwest, radar works quite well because the ground is relatively flat. However in the west where mountains rise to over 14,000 feet above sea level, the radar beam can hit the mountains and is prevented from finding snow that may be ‘hiding’ behind the mountains. When the government positioned the 150 radars, they took this into account, but that left skiers at a disadvantage. The goal of the government was to place the radars so that they covered the highest percentage of the population. This is a wise use of money, but it also meant that ski areas often have poor radar coverage because they are either far from populations centers (an therefore the radar itself) or because the higher mountain peaks block the radar beam. All of this boils down to the fact that radar is helpful but not a holy grail for skiers and riders. It’s helpful because it can show areas of snow and this allows us to find powder. But it’s not the holy grail because mountains are impenetrable to the radar, so it can’t always ‘see’ the snow near your favorite, high-peaked ski areas. That’s OK, though, because the accidental military discovery in the 40s is one of the most important breakthroughs for modern meteorology. And maybe it’s a good thing that radar isn’t perfect at detecting snow, because that keeps some mystery involved in our favorite game of chasing powder.